This freebie looks amazing! I’ve never seen a product quite like this before. It is a combo spoon, fork and knife. I’m not sure what to call this maybe a knorpoon? Either way this is a free plastic utensil that you can get for your home. 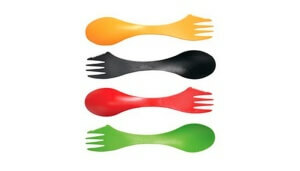 This would also be great for camping or hiking because it is an all in one utensil that can save room. I am really hoping this one will come. The website looks to be a bit out of date, but I’ve read that others have received this one before. Ignore the pop-up after you submit your information. The pop-up scared me a bit. I am still posting this one because it is such a cool item and I have read positive reviews. Also after looking into the website owner, the owner is a distribution company which is a good sign. Hopefully we get this super cool utensil.